OKINAWA, Japan -- U.S. military officials called off a search and rescue operation on Sunday for three U.S. Marines who were missing after their Osprey aircraft crashed into the sea off the east coast of Australia while trying to land. The U.S. Navy and Marine Corps suspended the rescue operation and launched a recovery effort instead, the Marine base Camp Butler in Japan said in a statement, essentially confirming the military does not expect to find the missing Marines alive. The Marines' next of kin had been notified, and Australia's defense force was assisting the Americans with the recovery effort, the statement said. 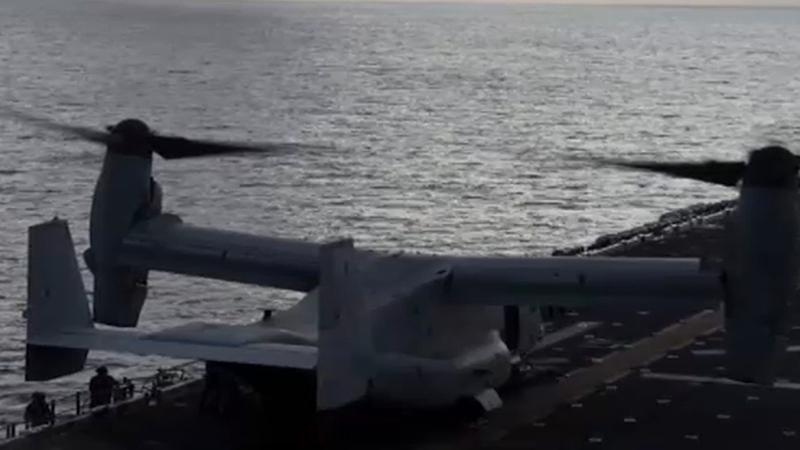 The MV-22 Osprey had launched from the USS Bonhomme Richard and was conducting regularly scheduled operations on Saturday when it crashed into the water, Camp Butler said. The ship's small boats and aircraft immediately responded in the search and rescue efforts, and 23 of 26 personnel aboard the aircraft were rescued. "Recovery and salvage operations can take several months to complete, but can be extended based on several environmental factors," Camp Butler's statement said. "The circumstances of the mishap are currently under investigation, and there is no additional information available at this time." The Osprey is a tilt-rotor aircraft that takes off and lands like a helicopter, but flies like an airplane. They have been involved in a series of high-profile crashes in recent years. The aircraft was in Australia for a joint military training exercise held by the U.S. and Australia last month in Shoalwater Bay in Queensland state. The Talisman Sabre exercise, a biennial event between the two nations, involved more than 30,000 troops and 200 aircraft. Australian Defense Minister Marise Payne said Saturday's incident occurred off the coast of Shoalwater Bay. "I can confirm no Australian Defence Force personnel were on board the aircraft," Payne said in a statement. Payne said she had spoken with U.S. Defense Secretary Jim Mattis "to offer Australia's support in any way that can be of assistance." A White House official said President Donald Trump had been briefed by chief of staff John Kelly on the mishap of an aircraft off the east coast of Australia. In 2015, a U.S. Osprey crashed during a training exercise in Hawaii, killing two Marines. Last December, a U.S. military Osprey crash-landed off Japan's southern island of Okinawa. Its five crew members were rescued safely. And in January, three U.S. soldiers were wounded in the "hard landing" of an Osprey in Yemen.